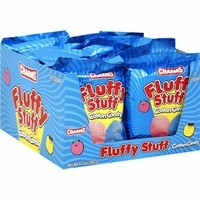 Charms fluffy stuff cotton candy. Buy your favorite cotton candy any time of the year. Although this fruit flavor cotton candy comes in a stay fresh foil bag instead of on a stick we promise you will still get sticky fingers. At one time this was considered just a summer time candy, you had to wait for the county fair or festivals to begin before you could enjoy this sweet treat. Now you can have it anytime of the year. Each bag is 1 oz. you get 12 bags in each box.